It’s way too easy for me to shovel down the straggler crusts of my kids’ PB&J or grilled cheese sandwiches and call it lunch…only to fight a losing battle with a bag of tortilla chips an hour later. This quick open-face has recently proven to be a good antidote to that cycle — and a vegetarian antidote at that. 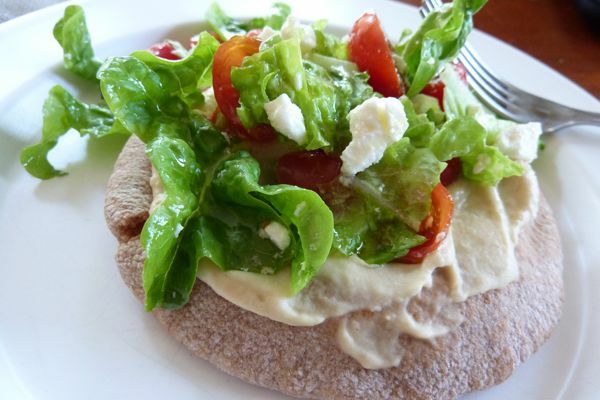 It’s a whole wheat pita spread with hummus and topped with a simple salad: bibb leaves, grape tomatoes, and feta tossed in red olive oil and red wine vinegar. 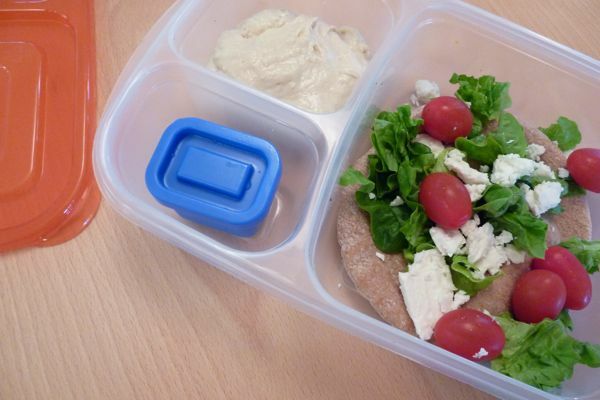 It also packs up nicely for the lunchbox for the kids or for you — should you be trying to kick that Chipotle takeout habit at the office. I absolutely love your site. I’m so glad I saw it featured on Design Mom. Thanks for all the great food! I adore your blog! The ideas, pictures, brilliant writing, and fun stories all make for a perfect recipe. I can’t wait to keep up with your family culinary adventures! Cheers! So funny…I just came back from a weekend in NYC and we ate at Chipotle TWICE! It was too tasty…so tonight I’m emulating their salad at home with a (hopefully) lower calorie count. Love the idea of an open faced sandwich though. Hi there. Love the site. Where did you get that compartmentalized glad-like container? I love it. thanks for sharing!!! andrea – I got the container at easylunchboxes.com. No lead, no BPA, no phthalates.